Tesco, Asda and Sainsburys were operating a cartel to keep dairy prices high. The Office of Fair Trading estimated that the collusion led to shoppers paying 2p more for a litre of milk and 2p more for 100g of cheese. Although Tesco has always denied collusion, it finally lost a decade-long court battle. 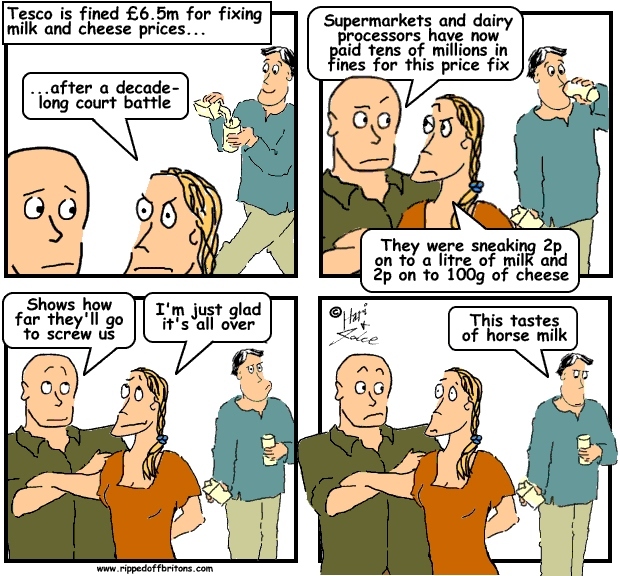 Supermarkets and dairy processors have paid £39m collectively in fines for this price fix. Fines are pointless, they should order them to freeze their prices for a couple of years to pay back the people they ripped off.